Guests join Selections Announcement to show support to the Audemars Piguet QEII Cup, which will be run on 27 April at Sha Tin Racecourse. 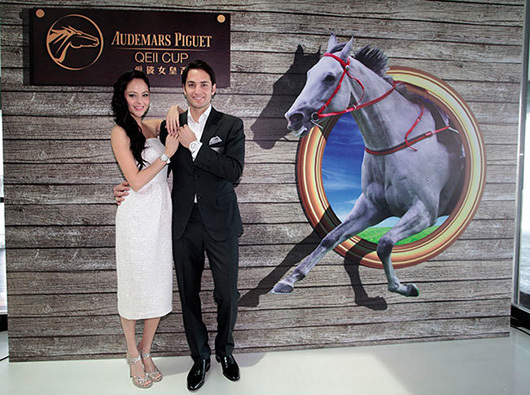 Elite sport and high-end chic come together with the 20th international edition of the Audemars Piguet Queen Elizabeth II Cup (HK-I), set for Sunday, April 27, at Sha Tin Racecourse. 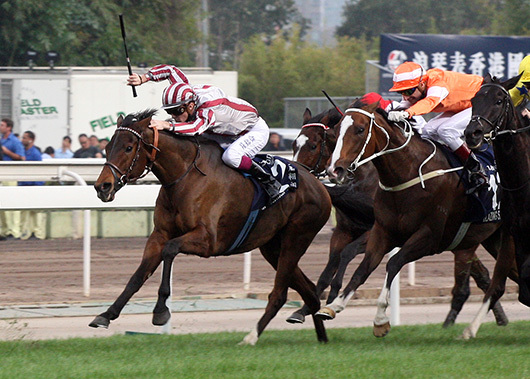 Several elite runners, including France’s Cirrus des Aigles, South African champion Vercingetorix, and Japanese classic winner Epiphaneia, are among five foreign raiders, all group I winners, in the 13-horse field announced for the 2,000-meter (about 1 1/4-mile) race, which carries a HK$14 million purse ($1,805,613 in United States funds). 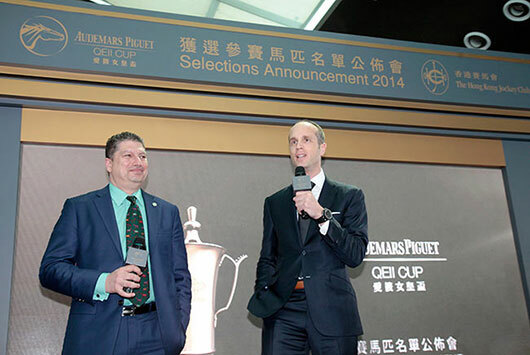 “We have seen some brilliant champions carry off the Audemars Piguet QEII Cup in the past, and with six individual international group 1 winners and some exciting rising stars, this could be one of the strongest renewals we've ever had—it’s shaping up to be a real classic,'' said Bill Nader, the Hong Kong Jockey Club's executive director of racing. Last year's QEII Cup victor Military Attack will have to replicate the brilliance he displayed 12 months ago if he is to become only the second horse to win back-to-back renewals. John Moore's charge is currently rated the best 2,000-meter turf horse in the world, but as well as a strong overseas challenge, Hong Kong's reigning Horse of the Year will have to contend with a home contingent brimming with established heroes and emerging stars, not least his own stablemate, this year's outstanding BMW Hong Kong Derby victor Designs On Rome. Designs On Rome will also face-off against his predecessor in BMW Hong Kong Derby champion, Akeed Mofeed, trained by Richard Gibson. 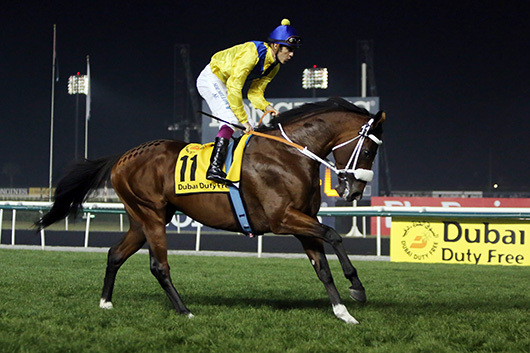 The latter, a powerful five-year-old, proved his mettle on the biggest stage with success in December's Hong Kong Cup (HK-I) and was a solid fifth in the Dubai World Cup (UAE-I) in March. And in an eagerly anticipated clash of the generations, this year's highly regarded Hong Kong Derby third, the Michael Chang-trained Dibayani, will join Designs On Rome against their elders for a first tilt at all-age group I company. Japan's horses are riding the crest of a wave on the international scene at present. 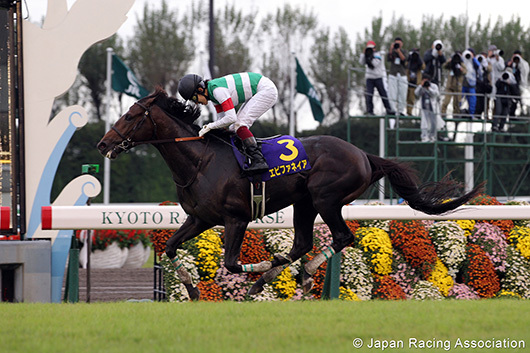 Japan has carried off the QEII Cup three times previously with Eishin Preston (2002 and 2003) and the Katsuhiko Sumii-trained Rulership (2012), and Epiphaneia represents the Sumii stable this time. Last year's Kikuka Sho (Jpn-I, Japanese St Leger) victor was runner-up in both the 2013 Satsuki Sho (Jpn-I, Japanese Two Thousand Guineas) and Tokyo Yushun (Jpn-I, Japanese Derby), and warmed up for this task with a smart third to Kizuna in a group II race at Hanshin. Meanwhile, Uncoiled has useful form at the top level against the likes of Japan's world stars Gentildonna and Just a Way. Vercingetorix also represents some of the best international form available at this stage of the year. The 4-year-old colt rounded out an unbeaten career in his homeland with success in the Daily News 2000 (SAf-I) in June of last year and maintained his unbeaten streak in the Jebel Hatta (UAE-I) at Meydan in March before running second to the outstanding Just a Way in the Dubai Duty Free (UAE-I) (1,800 meters). Vercingetorix is joined by his group I-placed stablemate Sanshaawes as trainer Mike de Kock chases a third win in the race following Irridescence (2006) and Archipenko (2008). French star Cirrus des Aigles, a three-time group I winner and a four-time competitor at December's Hong Kong International Races at Sha Tin for trainer Corine Barande-Barbe, was also in action on Dubai World Cup night and showed that he is at the top of his form with a fine second to Gentildonna in the Dubai Sheema Classic (UAE-I), a race he won in 2012. Hong Kong's strong defense also includes the Moore-trained Dominant, winner of the Hong Kong Vase (HK-I) in December, who ran on well from the rear to take fifth in the Dubai Sheema Classic last month at Meydan, and Same World, who triumphed in the January Cup at Happy Valley Racecourse earlier this year. Packing Whiz won the Chairman's Trophy in 2013. 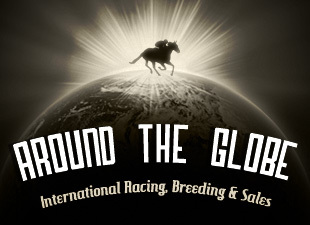 "With the field set to be a quality mix of top local and overseas runners, this race is certain to retain its place among the (International Federation of Horseracing Authorities) list of the World's Top 50 Group I Races,” Nader said. “Going right back to 1995, the Audemars Piguet QEII Cup has a history of attracting high caliber runners from around the world and this year is no exception. We have an excellent mix of elite Hong Kong runners going up against top-class international competitors, all boasting tie-ins to the best form lines from Europe, South Africa, Dubai and Japan. This is what international racing is all about. "The AP QEII Cup day has become a not-to-be-missed uptown society event in Hong Kong and it is great that we are able to showcase fantastic world-class sport on such a glamorous occasion as this." William A. Nader, Executive Director of Racing of HKJC and David von Gunten, Chief Executive Officer of Audemars Piguet Hong Kong and China, share their keen anticipation of the 16th running of the Queen Elizabeth II Cup and offer their best wishes to the elite runners. Michele Reis appears at the event with captivating style and glamour. She wears the Royal Oak Offshore Diver Limited Edition watch which is made specially for the Audemars Piguet QEII Cup 2014.